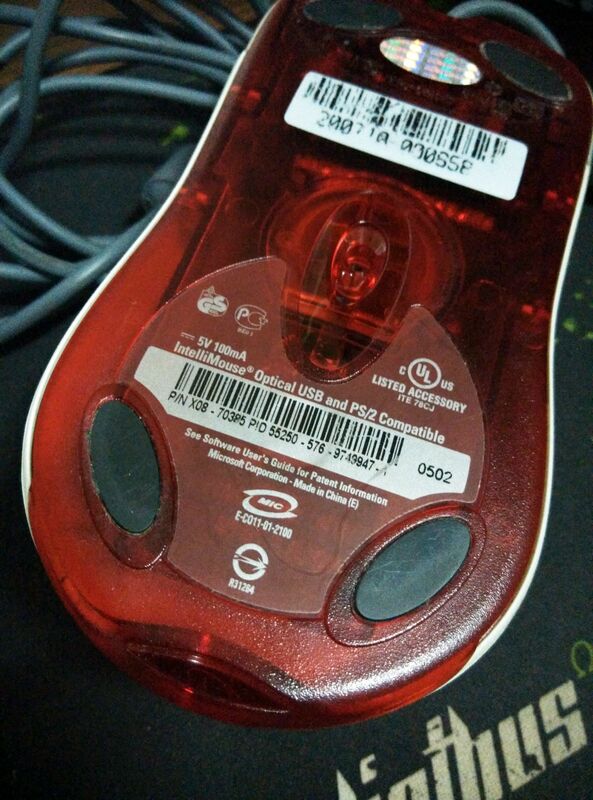 There's this thing in the internet about Microsoft Intellimouse and Optical Sensors. I saw a local online vendor in our country selling them(used) for around US$ 5.50 each or US$ 4.50 for every bulk of 10 pieces and above. I decided to get three of them. 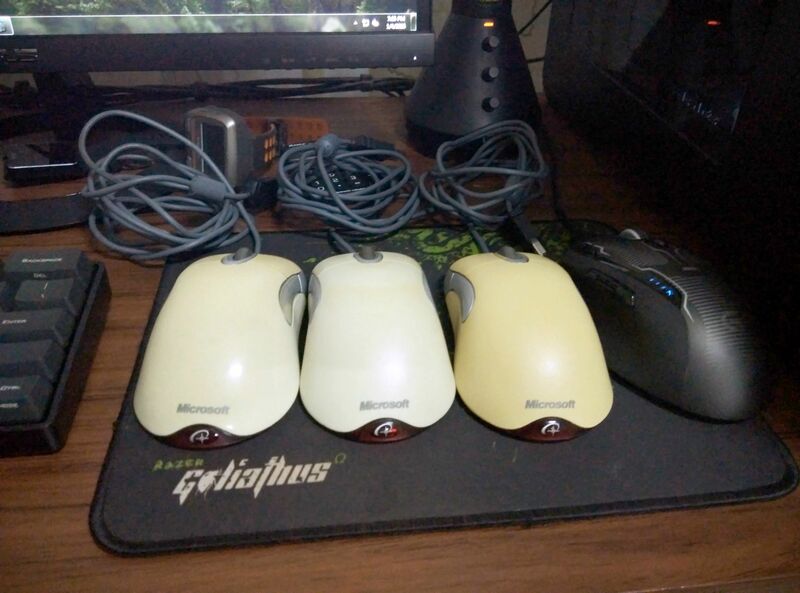 All of them are still in good condition and functional, and needs some cleaning after I bought. It has a bit of discoloration or yellowing - which is common with white or light colored unprotected ABS plastics when exposed to UV over time. The left and right buttons are really tactile and clicky, same goes with the middle(scroll) button. 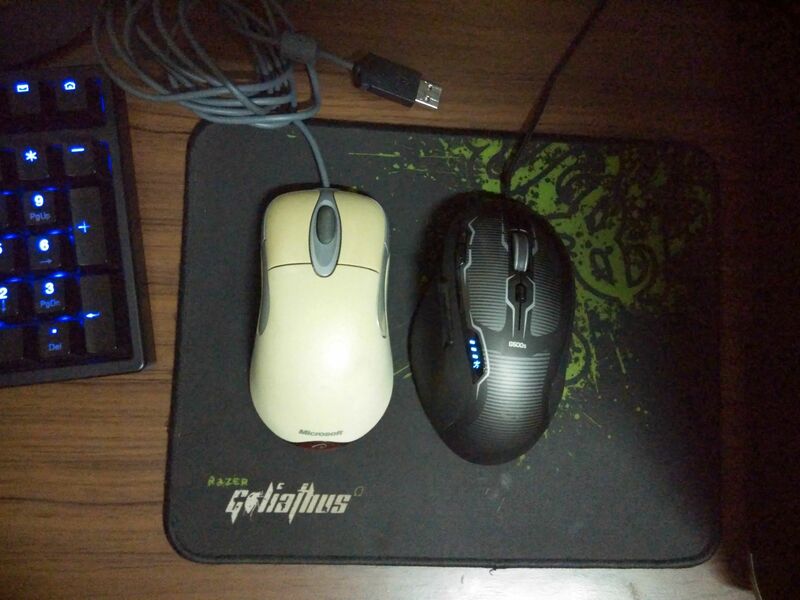 If I'll compare the switch that was used in the G500s and this Intellimouse; the latter has a more pronounced and crisp feel, and the "click" is more "clickier". The side buttons are really helpful for those who frequently uses macros, but the buttons are soft and mushy in feeling upon press. Program-specific settings is also available. If certain functions or key combinations is not available in the options, you can customize your own macro. 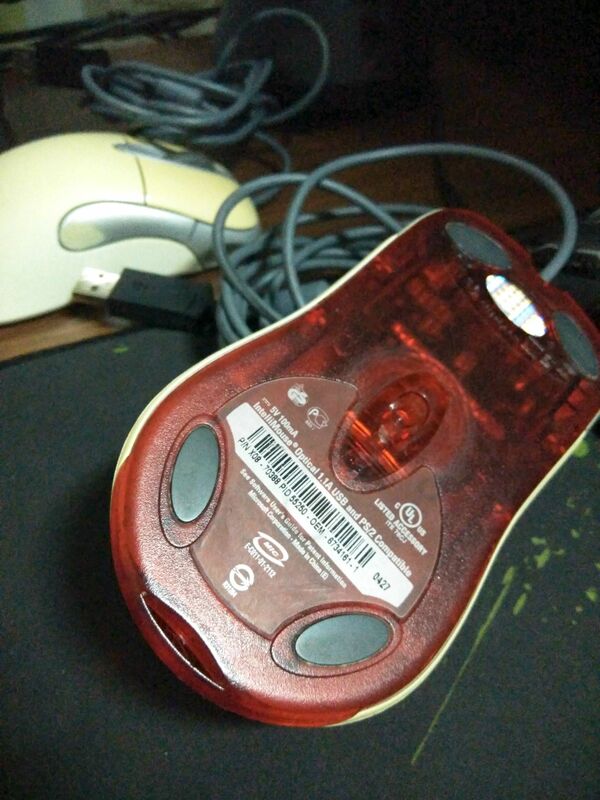 ...but the other two has "Intellimouse Optical 1.1A". Side-by-side with my G500s(daily driver). The ambidextrous shape of the mouse and its size makes it comfortable to use by people with medium to large hands. 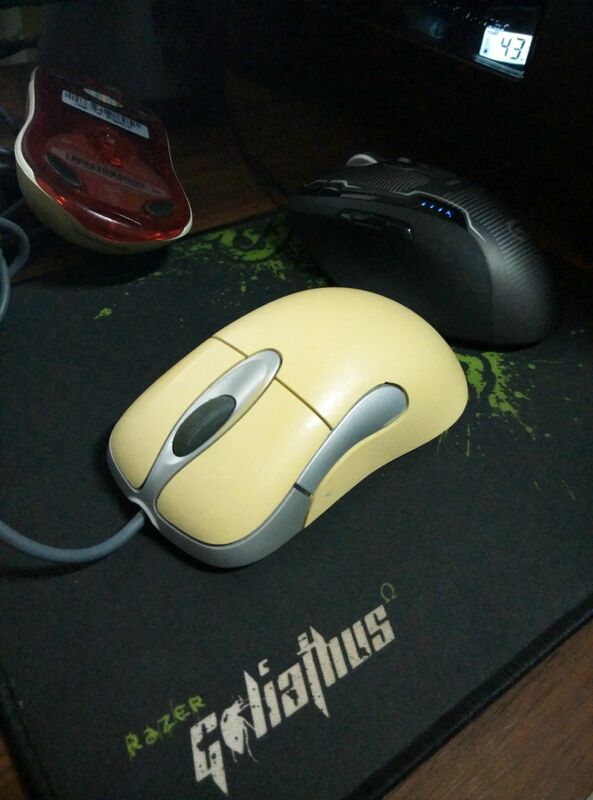 The closest mouse I can think of that represents the shape of the Intellimouse is the Steelseries Sensei. 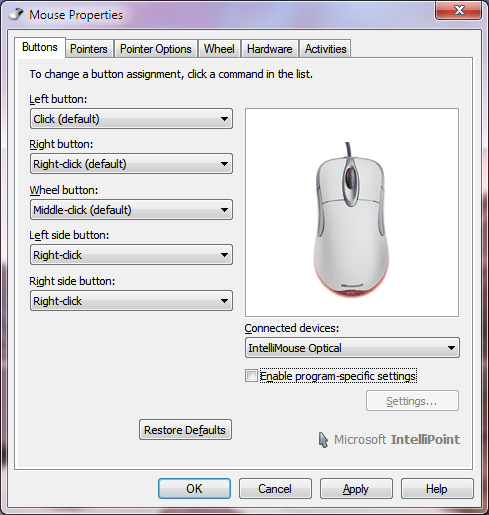 The IntelliMouse series is often credited for: Microsoft being one of the first mouse vendors to introduce a scroll wheel, an optical mouse, and dedicated forward- and back-buttons on the side of the mouse for easier web-browsing. 1) The mouse is light. I like it to have some weight, to have a balance speed and control. 2) Left and right side buttons are soft and mushy. It makes me feel not to use this buttons often. 3) Very low sensitivity(DPI). Not very useful on my 1080p display. 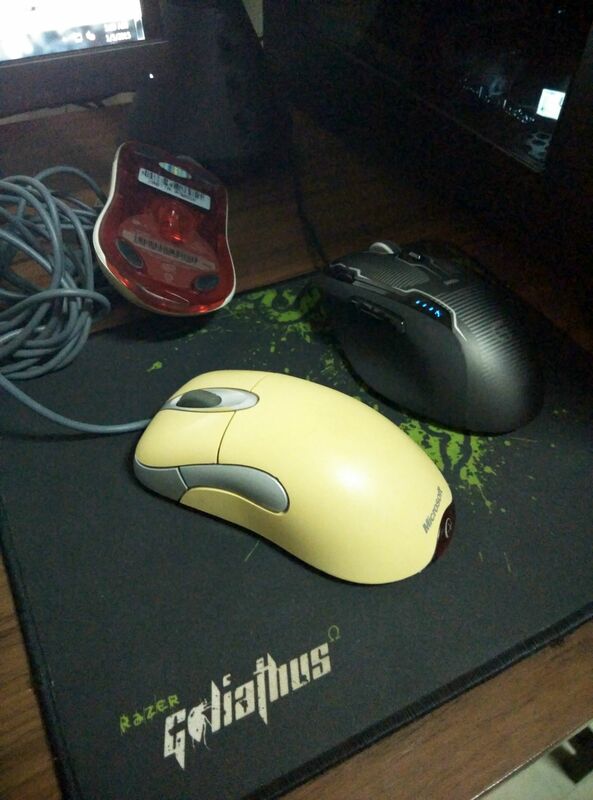 I always use my G500s on this with 3200 DPI and 500 MHz polling rate to minimize the needed mouse travel. 4) Materials used could have been better. Side buttons paint coat will fade with often use. The white body shell is not covered with UV-resistant coating and will suffer discoloration or yellowing over time. After all of that, it's still cool to own one of these mice. I like my WMO 1.1 for gaming and desktop. The sensor is really good. The responsiveness seems to be unbeaten. I use Win7 and force 1000Mhz for the USB port the WMO is plugged in. I prefer the WMO 1.1 over the IO 1.1 because the main buttons are a little bit "longer". I added side buttons to fit my needs. For me a Laser mice like the G500S w/ accerlation are not an alternative. Have all your 3 IO 1.1a a serial number start w/ X08? What's the screen resolution of the display that you're using? I'm having a hard time using the IO 1.1 in my 1080p display with its low DPI sensor, even on my laptop that has a 1366x768 screen res. It maybe because I'm used to less mouse travel when my G500s that is set to 3200 DPI. Yes. All of them has X08. The seller told me that it was just a package sent to her from China. I'm not from the US also. That's a nice a mod you did there. I didn't like the side buttons on this because it feels mushy. I'm curious on how you sleeved the USB cable. Does your mouse also have a plastic thing in the cable similar to this? I'm thinking that it might get in the way of your sleeving. I use 1920x1080 for desktop and gaming. I am used to it. Certainly a matter of getting used to. The plastic thing is normally a magnet and I removed it iirc. 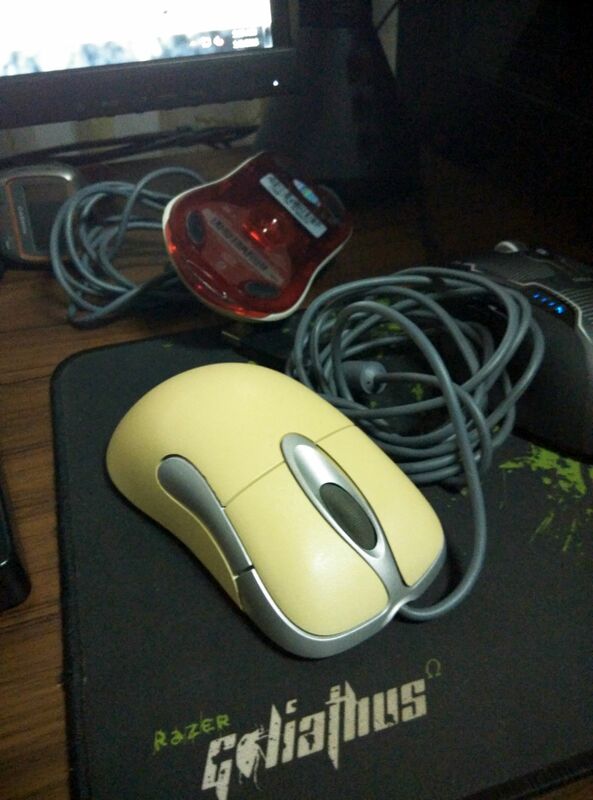 I always replace mouse cable of my mice. I like the very very light feel of a thin sleeved cable. What stands "PH" for in your profile? Well, I've never had a concern about the side buttons in the IMO — they always seemed fine to me. The holes for the side buttons had sharp edges that were irritating (I bought all mine new). And no rubber coatings either as those end up looking like the mouse is disease-ridden or decomposing. Dell mice are pretty good, but the IMO layout is fairly unusual. I cleaned a couple of intellimice a little while ago. They were heavily used and nasty dirty. Took them completely apart, once you remove a couple of screws in the bottom you can really disassemble the mouse nicely. All parts except for the one controller/optical PCB went into the dishwasher at 50°C INCLUDING the mouse wheel. Got them perfectly clean and they reassembled nicely as well. I just hate other peoples gunk in my mouse. Wodan wrote: ↑ I cleaned a couple of intellimice a little while ago. They were heavily used and nasty dirty. Took them completely apart, once you remove a couple of screws in the bottom you can really disassemble the mouse nicely. All parts except for the one controller/optical PCB went into the dishwasher at 50°C INCLUDING the mouse wheel. Got them perfectly clean and they reassembled nicely as well. I just hate other peoples gunk in my mouse. In case anyone else tries cleaning their mouse..
Becareful using hot water or something like a blow-dryer on the wmo scrollwheel, that shaft and sensor pegs, warps easily, and the rubber ring around the wheel may loosen as well. Wodan wrote: ↑ All parts except for the one controller/optical PCB went into the dishwasher at 50°C INCLUDING the mouse wheel. Got them perfectly clean and they reassembled nicely as well. I just hate other peoples gunk in my mouse. Unbelievable in that instead of using a little elbow grease you decide to use the Dishwasher. If I used my Mrs's Dishwasher to clean any of my cylinder heads, she'll first hit me in the head with the meat-tenderizer followed by drowning me in some bromelain. In fact I wouldn't be alive after she finishes me off. The Kitchen is NEVER used to clean any of my toys or gadgets - Rule Number ONE, at our household. i clean mice by hand. with love. it's fulfilling when you put it back together, knowing you've made sure every mm has been taken care of. bit of lube on the wheel.